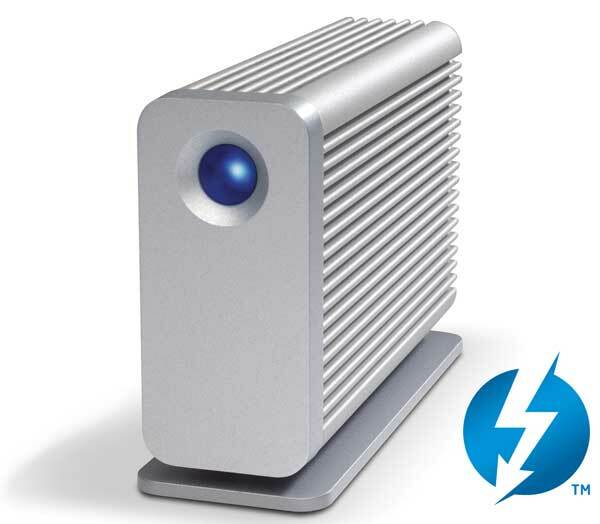 LaCie Little Big Disk - Thunderbolt-fast storage. Soon. Apple last week released its new MacBook Pro line, the first devices in the world to use the Intel Light Peak technology, now renamed Thunderbolt. This new technology will allow 10 Gbps of throughput in both directions. That’s 20 times faster than with USB 2.0, and over 12 times faster than with FireWire 800. What isn’t available yet, is a range of peripherals to take advantage of Thunderbolt. But at least LaCie have announced a new external hard drive will be forthcoming, in winter 2011. It’s called the Little Big Disk, with an aluminium case housing two 250GB Intel 510® Series Solid-State Drives. The Little Big Disk will be portable, weighing in at only 700 grams, and its bus-powered interface means there’s no need to carry around a power cord for the device. So who’s next with a Thunderbolt announcement? More importantly, who will be first with an actual peripheral on the shelves?